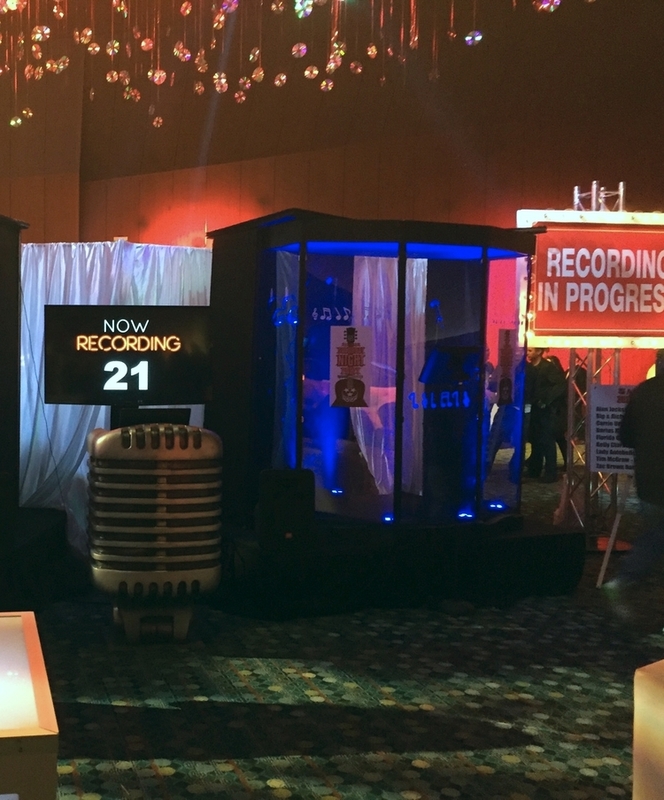 Snyder Entertainment can bring something to your next event that you can't get anywhere else except on the historic Music Row: recording booths. Custom built for Snyder Entertainment, our booths include: sound proof studio quality acrylic to silence outside sounds, 3 microphones + adjustable stands, multiple pairs of noise cancelling headphones, a monitor displaying the song lyrics, uplighting placed inside the booth, one or two professionally trained recording booth attendant(s), and a professional sound engineer outside of the booth. The process for your guests is easy, enjoyable, and always professional! It begins as the attendant ushers guests inside the booth, allowing up to 5 people at a time. The attendant quickly explains the experience, and guests then put on headphones, while the sound engineer checks the sound levels. The engineer will confirm and preview the song with the guests, and then the recording begins! The lyrics are displayed on the monitor, prompting the timing. Once the song is over, the attendant will usher the guests out of the booth. The sound engineer then transfers the recordings onto the guests keepsake memory drives, so that your guests can take their songs home! More than karaoke, Snyder Entertainment's recording booths will bring out the celebrity in you. We can't wait to see how much fun your guests have with it at your next event here in Music City. If you're interested in adding this fun entertainment element to your next party, contact us today. We will help you secure your date, begin picking out your playlist, and begin creating an incredible experience!